Long before Warner Bros. and writer-director Guy Ritchie settled on the title King Arthur: Legend of the Sword, the filmmaker’s fantastical reboot bore the tentative moniker of Knights of the Roundtable: King Arthur. That was in 2014, when the studio had purportedly drafted up plans for a six-film arc involving Charlie Hunnam’s would-be ruler and his battle to reclaim Camelot from the tyrant Vortigern (Jude Law). Since then, there’s been nary a mention of Warner’s franchise hopes, which tells us that the company has either consolidated that vision into a single tentpole, or at the very least, nudged any and all talk of a sequel onto the back-burner for the time being. It’s also important to remember that Legend of the Sword has been delayed not once, but twice, and after bouncing around various release dates, Ritchie’s star-studded epic is now smack bang in the middle of Guardians of the Galaxy Vol. 2 and Alien: Covenant. It’s a tricky corridor for any film, let alone a gritty medieval reboot designed to resurrect a long-lost hero. There’s still reason to be hopeful, of course; thanks to those Sherlock Holmes movies starring Robert Downey Jr., Guy Ritchie has proven that he’s more than capable of presenting a legendary figure through a totally new lens, and make a killing at the box office while doing so. Will lightning strike twice? 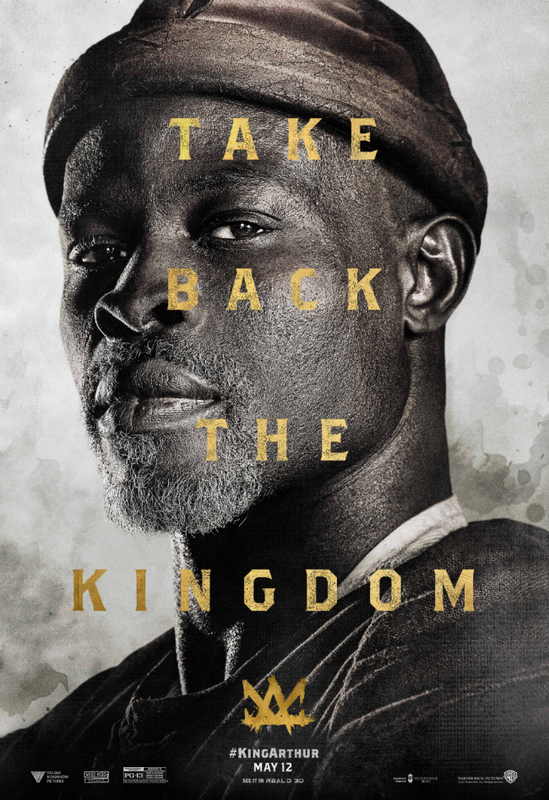 Who knows, but there’s no doubt that the studio has recruited a starry ensemble here, and the latest character poster has arrived to shift the focus over to Djimon Hounsou’s Sir Bedivere. “From nothing comes a king.” Guy Ritchie’s King Arthur: Legend of the Sword will march into theaters on May 12th. We’ve collected all of the primary character posters released thus far for Warner Bros.’ bold fantasy epic below, with the others spotlighting Jude Law’s aforementioned tyrant and Guinevere, the dazzling mage to be played by Àstrid Bergès-Frisbey. Check them out and be sure to let us know what you think.